Biography: Born in Houston, Texas, Osteen is one of five children of John Osteen and Dolores (“Dodie”) Pilgrim. His father, a former Southern Baptist pastor, founded Lakewood Church where Osteen is the current senior pastor. Osteen married his wife, Victoria L. Iloff, on April 4, 1987. They have two children, Jonathan and Alexandra. His older siblings, Paul, Lisa, and Tamara, and his younger sister, April, are also involved in full-time ministry. His half-brother Justin does missionary work out of New York. After 17 years producing the church’s television program, Osteen succeeded his father on October 3, 1999, as pastor of Lakewood Church. He had only preached once in his life, the week before his father’s death. Today, Lakewood Church services, led by Pastor Joel Osteen, are seen in over 100 nations around the world. Joel Osteen’s first book, Your Best Life Now: 7 Steps to Living at Your Full Potential, was released in October 2004. In December 2006, he was named one of the year’s “Ten Most Fascinating People” by Barbara Walters. Former presidential candidate John McCain has described Osteen as “inspirational”. Currently, Osteen and several Lakewood Church personnel travel across the nation, presenting programs in large arenas. The event, titled “A Night of Hope”, includes worship music led by the church’s music ministry, a sermon from Osteen and a testimony by his mother, Dodie. In 2007, the tour expanded to include stops in several other countries, including Canada, England, Northern Ireland and Israel. Osteen released his second book, titled Become a Better You: 7 Keys to Improving Your Life Every Day in October 2007, which also topped the New York Times Best Sellers List with a first printing of four million copies. Osteen told Larry King the new book will focus more on relationships and not getting stuck where we are in life. “Just my basic message of becoming all God’s created you to be,” he added. 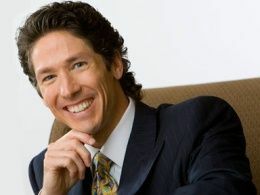 Osteen’s popularity led to him being featured as one of ABC News’ “10 Most Fascinating People of 2006”, and was named “Most Influential Christian in America” in 2006 by The Church Report. This entry was posted in Sermons and tagged God Will Bring You To A Flourishing Finish, Pastor Joel Osteen, sermon by admin. Bookmark the permalink.